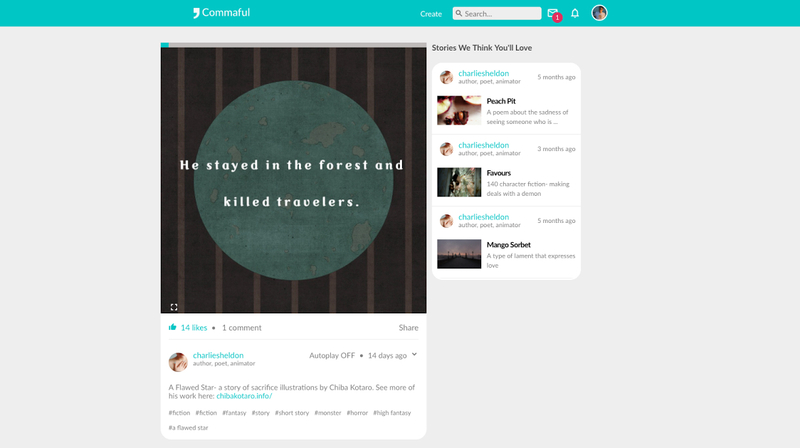 Commaful – An On-line Writer’s Community at Your Fingertips! My name is Sydney, I’m a 22 year old dropout from USC working on a site called Commaful. Our mission is to help more people enjoy the written word in a world with busy schedules and lower attention spans. We’ve made a new format, that looks a bit like a picture book and allows people to tell fictional stories, poetry, and more, all in a beautiful, short format. The stories have reached over 1M people, primarily teens and we’ve featured some celebrities and published authors. When Sydney said he’d like my feedback on the Commaful experience, well, I thought what a better way to share it and get feedback from more folks than just me – then to do an email interview and blog about it! I hope you find this information inspiring – and that you take a moment to see what Commaful has to offer. I’ve highlighted in RED the details that really sparked my interest. 1) Give us a bit of background on Commaful – What was its inception? Why? Commaful began as a project to share writing in a fun way to our friends. We noticed our friends were obsessed with Snapchat and Instagram, but less so with our writing. We wanted to create a fun format that would get them excited. As more and more people joined, the community blossomed into what it is today. 2) There are writing platforms that exist on the world wide web. I can think of Wattpad off the top of my head. Beyond personal blogging, these ‘open spaces’ are homes for writers to share their work. What makes Commaful unique from a platform like Wattpad/blogs? All Commaful stories are told in a picture-book like format. The format opens the doors to a lot of creativity. For example, here is an illustrated story on Commaful by a talented illustrator named Chiba and one of our community members, Charlie: A Flawed Star. As you can see the format adds something really unique to the experience. The stories are also embeddable, unlike most blog posts or Wattpad stories. You can read embedded stories directly from the blog, which makes it a great tool for bloggers to use to show case ideas or visuals with their stories. Finally, the stories can be turned into story trailer videos. Making them really easy to share on Instagram, Twitter, Tumblr and Facebook. These trailers are optimized for each social network to reach and engage more people than sharing a link to your story or blog post (currently supported on most blogs like Blogger, Wix, Weebly). A blend of visuals and text is most common at the moment. The text conveys the plot or storyline where the images providing support or share the emotion/feeling that the author wants to convey. 4) What genre of writing has the most action? Why do you think this is so? The feelings tag is one of the most popular tags on the site right now. There are a lot of emotions and feelings that are difficult to convey through existing social media sites in a way that accurately reflects the feeling. Through poetry, metaphors, and plots, writers can really convey the exact emotion. I think the combination of visuals and text really helps people pinpoint that feeling on Commaful. 5) How does a platform like Commaful help writers? Any specific feedback that speaks to this ‘support’? The most powerful thing about Commaful is the community of writers supporting each other. We constantly get messages about how writers considered quitting or faced heavy writer’s block but were inspired by the stories they read or the people they met within the Commaful community. We also host fun writing contests to help writers stretch their creative muscles and meet other writers. Finally, we have a Facebook messenger bot that we have been building to help teach writers marketing and storytelling with lessons from experienced writers. The bot isn’t up yet but will be updated onto this link in mid to late August. 6) This is a ‘free’ platform – why? Someone (you?!) is footing the bill of creating and maintaining it. We are very lucky to have a few amazing investors who believed in the mission from day 1. We recently also started a Patreon to help keep the site ad free. 7) Do you know if agents/publishers connect with Commaful to look for new writers? Any success stories related to this? I know that some small or newer poetry publications have discovered poets on Commaful and have reached out to feature their work in publications. I’m sure there will be more examples of this as we continue to grow! 8) ‘Time’, and the fact that we seem to have less of it because we’ve got so much ‘media’ to fill it with, plays a roll in Commaful. Explain how the ease and quickness of it affects your traffic/writers/etc. Commaful was initially designed to be easy to read and easy to create. We designed the tool to make it easy to make stories on-the-go through a phone. Most stories are comfortably under 1000 words. Commaful stories are meant to be quick, and as a result are fast to create and fast to consume. A lot of people read and write Commaful stories during short breaks. 8.5!) Explain how the ‘comments’ work – are they for editorial purposes? Likes/dislikes? is someone monitoring them? The “likes” system influences how stories get discovered by people browsing the site for stories to read. Commenting is used to drive discussion, feedback, and community. We aim to keep the comments as constructive and positive as possible. To keep things civil and safe, there is a report button for each comment and we review every reported comment. 9) What is your ultimate goal for Commaful? We want to spread the love of reading and writing to the world. We want to support both budding and successful writers, artists, and comics and build an audience around these talented creatives who deserve an audience for their work! 10) Are YOU a writer? What do you like to write and why? I’m more of an aspiring writer. In the last few years, I wrote more about the ideas in my head and scribbled down random pieces of poetry. A couple of years ago, before we started Commaful, I remember being on the road late at night and seeing the ocean and the stars. There was a beautiful contrast between the moon and starlit ocean and the technology lit coast. I scribbled down a quick poem on a piece of paper I found, but never ended up doing anything with it. If Commaful were around, I would have published on the spot and actually used the picture of the scene that inspired me to create it. I still have a small collection of dragon fantasy stories that I wrote a few years ago but never shared. I plan to adapt them into Commaful stories when I get a chance as well. 11) What book(s) are you reading? These last few months I’ve been mostly listening to non-fiction books through Audible and spending my reading time on Commaful. I’m currently working on Sapiens, which has taught me so much already. Several people have recommended it to me over the last year and it’s lived up to the high expectations i had for it. 12) What are some writing sites that you frequent (including bloggers)? I really like BookRiot for all my bookish content. Their podcast is really fun and filled with great book-ish info. Thanks so much Vanessa for sharing our story! We are always learning so if anyone has any ideas or questions, you can message me on Commaful or tweet at us on Twitter. We are very responsive! I do hope that this post motivates you to visit Commaful!